Luxurious Volume Color Care Shampoo <br /> <br />Maintain texture and volume while you protect against fading. Luxurious Volume™ Colour Care Shampoo, with Caffeine Vitality Complex, adds space between hair strands for greater volume, and its gentle formula won't fade your colour. Maintain texture and volume while you protect against fading. Luxurious Volume™ Colour Care Shampoo, with Caffeine Vitality Complex, adds space between hair strands for greater volume, and its gentle formula won't fade your colour. www.johnfrieda.com/patents to determine if the product is protected by any U.S. patents. Ingredients: Water, Sodium Laureth Sulfate, Glycerin, Cocamidopropyl Betaine, Coco-Glucoside, Sodium Lauryl Sulfate, Fragrance, Sodium Chloride, Lauric Acid, Polyquaternium-7, Benzyl Alcohol, Disodium EDTA, Laureth-16, Malic Acid, Polyquaternium-52, Glycine, PEG-12 Dimethicone, PPG-9, Sea Salt, Caffeine, Stearoxypropyl Dimethylamine, C14-28 Isoalkyl Acid, Alcohol Denat., Amp-Isostearoyl Hydrolyzed Wheat Protein, C14-28 Alkyl Acid, Methylchloroisothiazolinone, Stearyl Alcohol, Methylisothiazolinone, Sodium Hydroxide. I have spent hundreds of dollars trying to find a product that would give my thin lifeless hair volume and lift. I have been using the Luxurious Volume shampoo, conditioner, 7 day volume, fine to full blow-out and the all-day hold hairspray now for a month. This product actually works. My hair looks so much healthier since I have been using this product and it does give my hair volume. Thank you for making a product that does what it says it will do. My colored hair feels like I just left the salon! I have always been happy with John Frieda's Luxurious Volume line of hair products, but with the addition of the new "touchably full" shampoo and conditioner, I have two new reasons to love this JF line. I love the healthy, full feel of my just colored hair. This product mimics that feeling perfectly. I can't be more pleased after using John Frieda's hair color and then treating it lovingly with this new shampoo and conditioner. 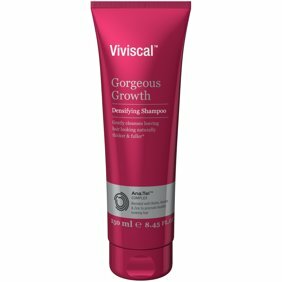 I love this shampoo becase my hair is so clean, smells very good and doesnt have that super flat texture that i normally have. I recommend this product. I love this shampoo. It keeps my color from fading and gives my pathetically fine, limp hair some volume. 1. Yes, this product works fine on my fine textured, gray hair. Enjoy! 2. Yes, of course! Or you can use the other John Frieda Volume shampoos. They are wonderful. 3. This product is only designed for color-treated hair.